How to Sync Facebook Contacts to iPhone in iOS 12/11/10? After using the Facebook application on your iPhone for a long time, you will have a lot of data saved in your Facebook account. This data includes your contacts. 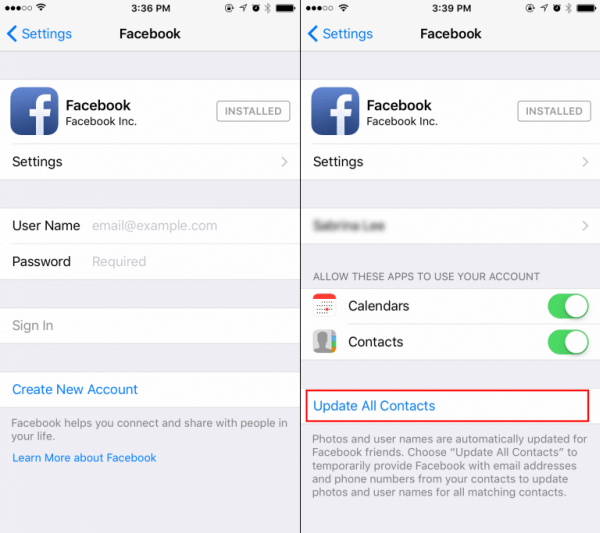 If you have lost your contacts on your old iPhone or you just purchased a new one, you can sync Facebook contacts to iPhone in iOS 12/11. The question is, how can this be done? We answer this question below. Part 2: How to Sync Media Files To Your New iPhone? Generally, Facebook will have a lot of your information including phone numbers, addresses, birthdays, etc. All you need to do to get this information from Facebook servers to your iPhone is sync them. This section will focus on helping you get contacts from Facebook. Step 1: If you have a new iPhone with no Facebook App, download it from the App Store and install it before proceeding. Step 2: Launch the app and log in using your credentials. Step 3: Launch Settings on the iPhone you wish to sync Facebook contacts to, scroll down and tap the Facebook App. You will be asked to sign in. use your FB email and password to sign in. Step 4: After signing in, toggle on Contacts and Calendars in the Facebook screen. Step 5: Below the Contacts and Calendars options, you will find the "Update All Contacts" option. Tap this option to sync Facebook contacts to iPhone. Bonus: How to Sync Media Files To Your New iPhone? Transfer all your files without the need to open iTunes. It transfers both non-purchased and purchased music. 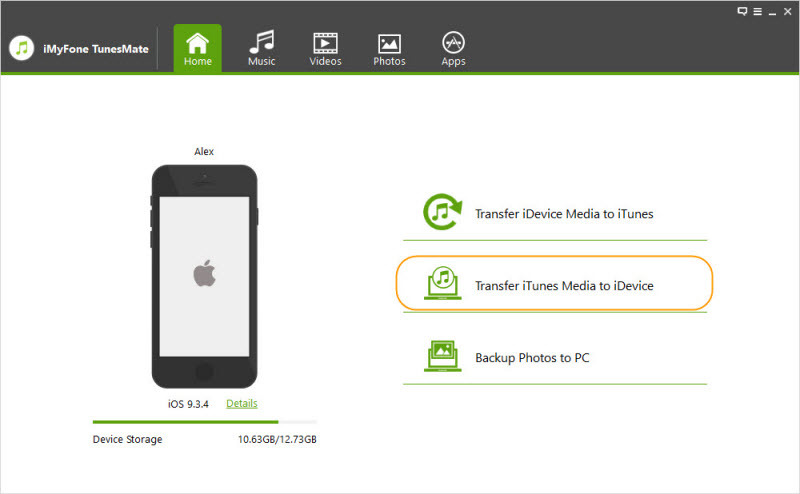 You can transfer all media types including audiobooks, music, photos, ringtones, playlists, podcasts, etc. 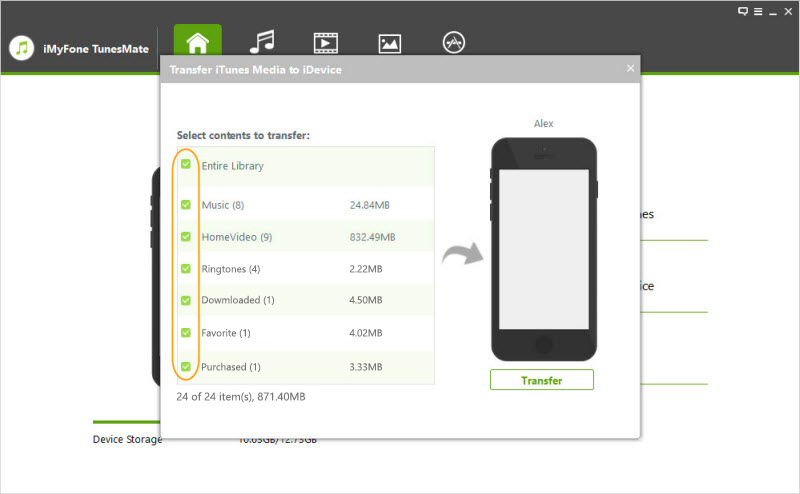 The tool offers a two-way transfer: with a single click, you get to transfer all your media from your iOS device to iTunes/computer and vice verse. Step 1: Launch iMyFone TunesMate, then connect your iOS device to the PC using a USB cable. Step 2: Tap the “Transfer iTunes Media to iDevice” option. This is the second option on the TunesMate home interface. Tunesmate will scan the media files available in the iTunes Library and display them. Step 3: If you wish to transfer all the Media files available on iTunes to the device, you can leave everything checked and just click Transfer. Also, you can check specific media files to transfer and then tap Transfer. Click OK to complete the transfer. Permanently erase all iOS data: WhatsApp, Viber, messages, photos, videos, call history, note, etc, 100% unrecoverable!